This article describes the method used to build the Basque Verb Index (BVI), a corpus-based lexicon. The BVI is the result of semiautomatic annotation of the EPEC corpus with verb predicate information, following the PropBank-VerbNet model. 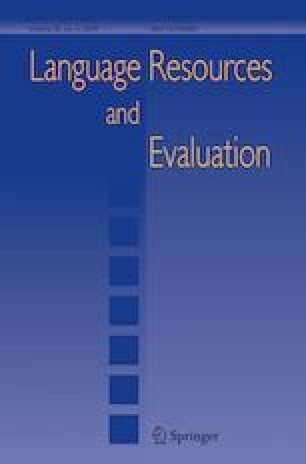 The method presented is the product of a deep study of the syntactic–semantic behaviour of verbs in EPEC-RolSem (the EPEC corpus tagged with verb predicate information). During the process of annotating EPEC-RolSem, we have identified and stored in the BVI lexicon the different role-patterns associated with all verbs appearing in the corpus. In addition, each entry in the BVI is linked to the corresponding verb entry in well-known resources such as PropBank, VerbNet, WordNet and FrameNet. We have also implemented a tool called e-ROLda to facilitate the process of looking up verb patterns in the BVI and examples in EPEC-RolSem as a basis for future studies. This research has been supported by the Basque Government: (IXA group (IT344-10), the Ministry of Science and Innovation of the Spanish Government (PROSA-MED (TIN2016-77820-C3-1-R)) and MINECO: TUNER (TIN 2015-65308-C5-1-R). Bonial, C., Bonn J., Conger K., Hwang, J., Palmer M., & Reese N. (2015). English PropBank annotation guidelines. http://propbank.github.io/. Accessed 4 Sept 2016. Bunt, H. C., Petukhova, V., & Schiffrin, A. (2007). LIRICS Deliverable D4.4. Multilingual test suites for semantically annotated data. http://lirics.loria.fr. Accessed 23 June 2014. Estarrona, A., Aldezabal, I., Díaz de Ilarraza, A., & Aranzabe, M. J. (2016). Methodology for the semiautomatic annotation of EPEC-RolSem, a Basque corpus labelled at predicate level following the PropBank/VerbNet model. In E. Vanhoutte (Ed. ), Digital scholarship in the humanities (Vol. 31, No. 3, pp. 470–492). http://dx.doi.org/10.1093/llc/fqv010. First published online: 17 June 2015 (23 pages). Published by Oxford University Press on behalf of EADH: The European Association for Digital Humanities (Online ISSN 2055-768X - Print ISSN 2055-7671). https://academic.oup.com/dsh/article/31/3/470/1745349. Laka, I. (1996). A brief grammar of Euskara, the Basque language. University of the Basque Country. ISBN: 84-8373-850-3. http://www.ehu.es/grammar. Accessed 21 Feb 2017. Schiffrin, A., & Bunt, H. C. (2007). LIRICS deliverable D4.3. Document compilation of semantic data categories. http://lirics.loria.fr. Accessed 23 June 2014.